An iconic classic in its own rite, Quelques Fleurs is a true ingenious scent of its time. Created for the lady who is elegant with a timeless sophistication. Being the first ever true multi-floral blend ever created. The exuberant combination of florals captivates the senses with a soft and sensual burst of flowers. Now available as a travel spray set. 7.5 mL/ 0.25 fl. oz. each. Founded in France in 1775 to cater to nobility, family-owned Houbigant de Paris boasts almost 230 years of historic artistry in perfume making. The brand's renowned perfume, Quelques Fleurs, was first created in 1912 and remains an elegant, floral scent with devotees around the globe. 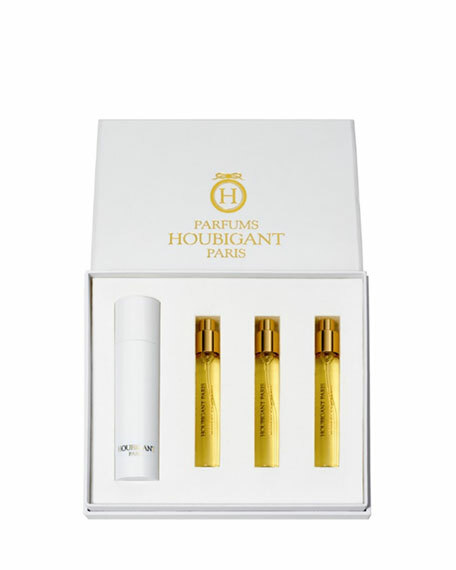 In fact, the entire collection of Houbigant Paris fragrances are much loved worldwide by those with discriminating taste.